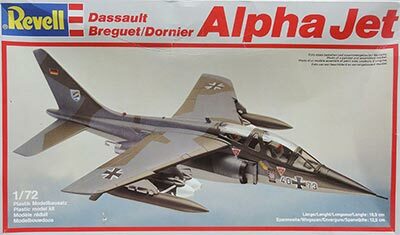 The Dassault/Dornier Alpha Jet is a light attack jet and advanced jet trainer that was co-manufactured by Dassault Aviation of France and Dornier Flugzeugwerke of Germany. It was developed end 1960s specifically to perform as trainer with instructor and student but also in the role for light attack. It got a 2 SNECMA/ Turbomeca Larzac engines giving it a top speed of about 1,000 km/hr. First flight was in 1973 from Istres with first deliveries in 1978. 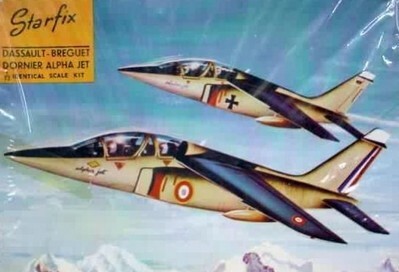 France Armee de l'Air got about 175 Alpha jets "E" trainers and West-Germany Luftwaffe about 175 Alpha jets "A" for the light attack role. Pylons for light arms and a belly gun pod with initially a 7,62mm gun (and later possibly a DEFA 30mm canon). The French Alpha jets had the Martin Baker ejection seats (probably mk.4 or mk.10) but the West-German ones the Stencel III seat. 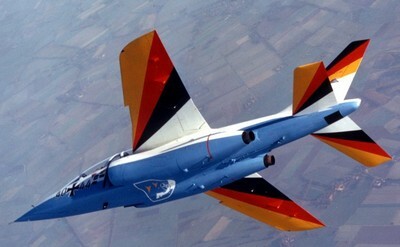 The Alpha jet replaced also the Fouga Magister in the demonstration team "Patrouille de France". 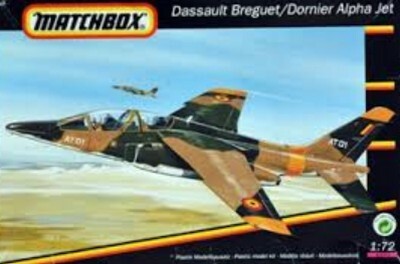 Export success was great and it was used also by the air forces of Belgium, Cameroon, Egypt (MS1 version locally licensed manufactured), Morocco, Nigeria , Portugal (ex-Luftwaffe) , Qatar, Thailand, Togo. Some were also used by dedicated companies in Canada and the U.K. 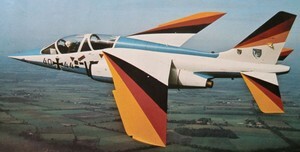 Eventually about 512 Alpha jets were manufactured. 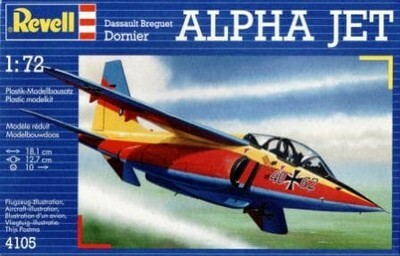 For some unknown reason, kits of the Alpha jet never drew my attention as modeller. Though I saw them at many air shows and had seen the old Airfix 1/72 scale model as a kid in shops but never bought a kit. 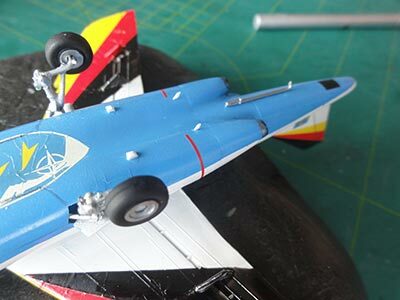 Well, that changed 40 years later and many models in 1/72 will be made for the World Air Forces model collection. 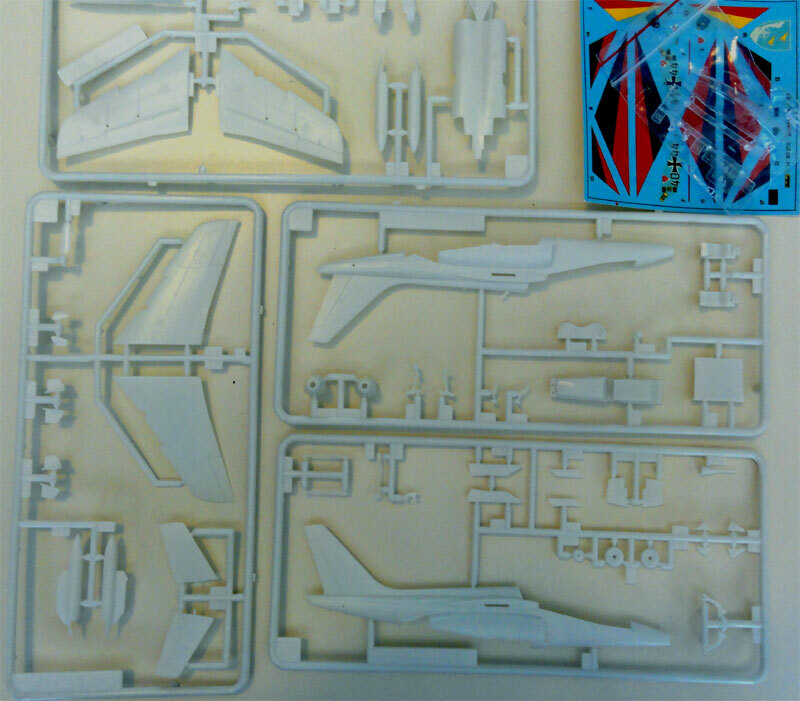 Various models in 1/72 appeared over the years, also with the same kit mould in re-boxed releases. The kit from Starfix appeared to be the first kit #3123 of about 1970, but I never saw it though it also re-appeared in 1991 as Plastik copied the kit #S147. (The shapes seen on the internet seem a bit suspect to say the least). The brand Matchbox came in 1972 with a simple but better kit #PK-05 in multi coloured plastic but it was welcome indeed. It was also released by AMT in the 1970s. Heller from France came with their first kit #257 in 1977 and was a vast improvement over previous kits. It appeared in various boxes with different decals over the years. 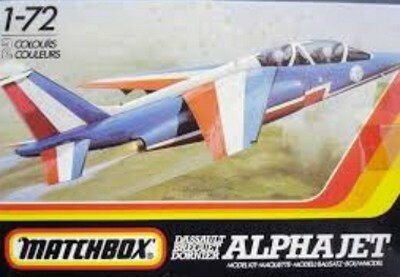 Next appeared the Airfix kit #03035, first released in 1980 in series 3. 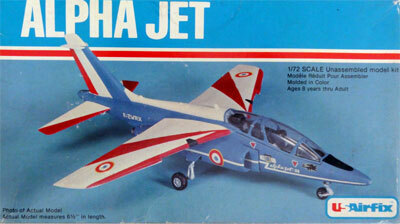 It also appeared in various boxes such as by US AIRFIX #4012 in 1980 and by MPC in 1983. 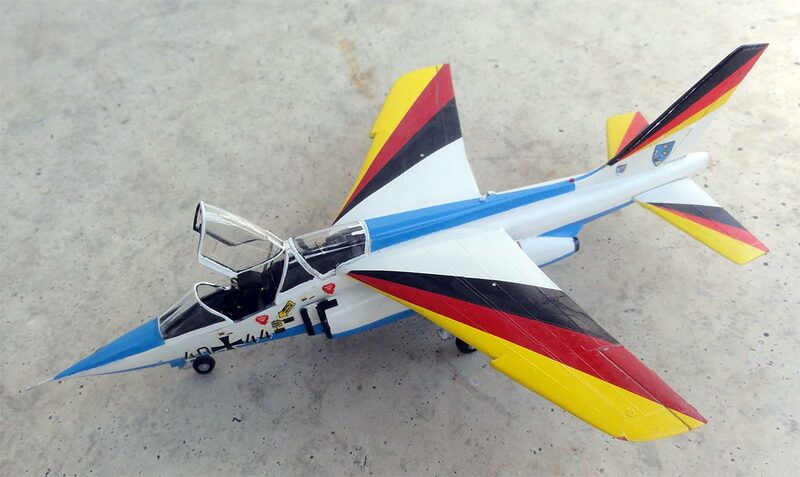 Fujimi of Japan came in 1983 with their kit #7A-B1. Revell Germany released their first kit #4334 in 1984, which was in fact the same Fujimi mould in a Revell box! 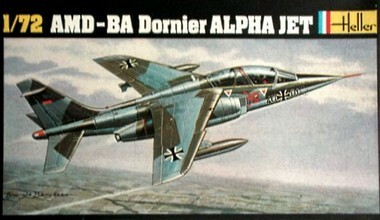 There are surely other Alpha jet kits and releases, such as from Lodela #9257 in 1987 with the same Heller/Revell kit. 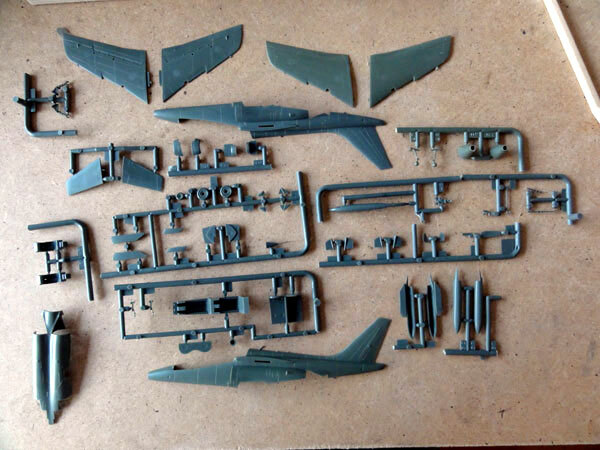 Several Alpha jet kits will be made in 1/72 in this modelling project. 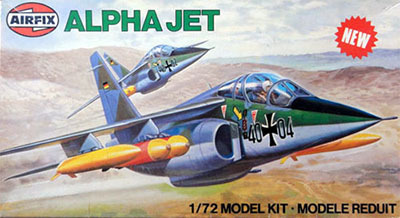 The first 1/72 Alpha jets are from Heller. 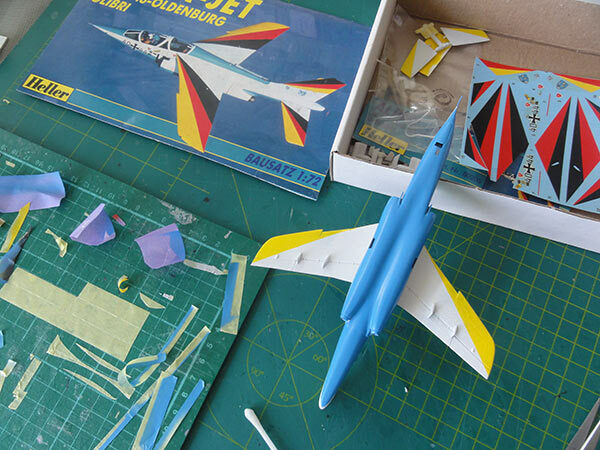 The kit from the 1970s has about 60 parts in grey-green plastic and a single piece canopy. There are 2 nose tip parts: for the German "A" or trainer "E". The kit looks OK but off course is a 40 years old kit. The basic parts are fine with a few raised panel lines though very thin. Any sanding needed will remove these but I took care to retain as many of them as possible. The decals are often unusable, so seek after market decals, like the ones from Print Scale that I purchased. - vertical fin can be sanded a bit "pointier". 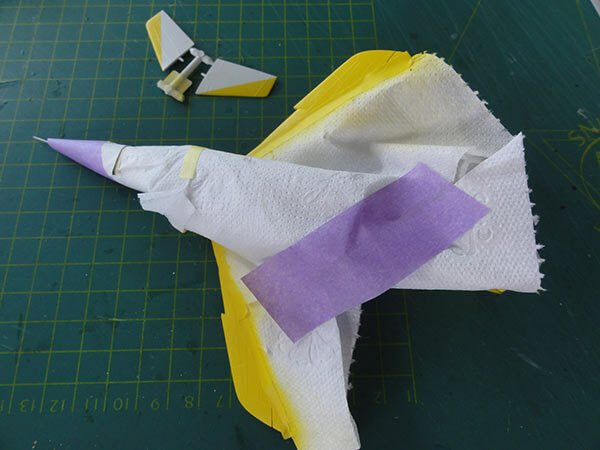 - horizontal stabilizers look to have a 0,5 mm too large chord, hardly noticeable. - wing leading edge lights were only on prototype aircraft, so fill these recesses; fit small landing lights on the 2 gear legs. - the wing fuel tanks look 6 mm too short. - large belly tank looks a bit rough. When used and fitted as gun pod it shows no gun. - antenna configurations may vary between Alpha jets, so study photos. The Heller kit tail antennas #13,14 look far too large so are better replaced with thin card. The intakes are small and a bit shallow, I just painted the fuselage intake rear areas black. (2) some later delivered aircraft have 2 nose strakes; as needed these are to be made from card; (but not on French or West German Alpha Jets). (3) sometimes, exported Alpha jets delivered to various air forces show a remarkable high fuselage spine (like on the C1 version). A long spine is than seen that runs say 3/4 of the upper fuselage to the vertical tail and with a different spine antenna. When desired for your particular model, make this spine from rod and putty at this assembly stage. Obviously, fit these particular "add ons" on your kit before proceeding with any paint scheme. The first Heller kit made was in a special edition #80205 released in 1986 with colourful West-German markings for JABO 43. This particular model will be made as per kit scheme. 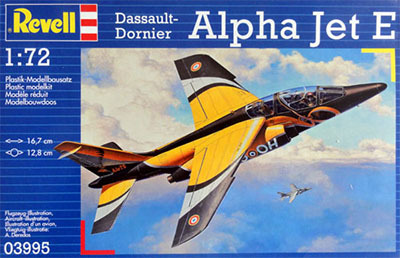 This Alpha jet was called the "colibri". The parts are here in white plastic (in other Heller releases the well know grey-green). 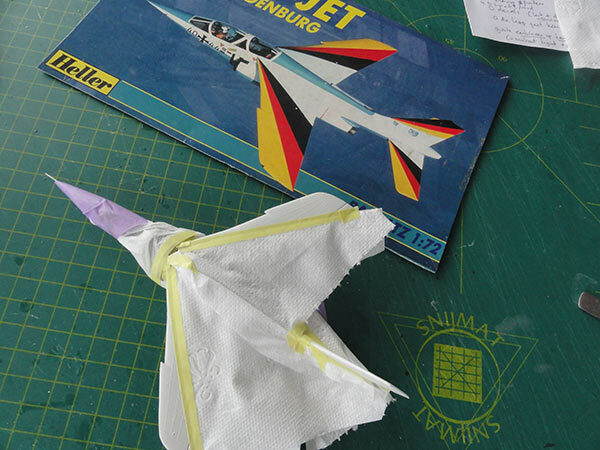 There are in this kit 2 nose parts: for the West German "colibri" the pointed nose with pitot is needed. The smaller corrections were made as listed above. The cockpit tub sides shows some gaps, these were closed with thin card as well as at the rear. I also closed inside the fuselage the "see through" at the exhausts #29, 30 by fitting in a piece of card. 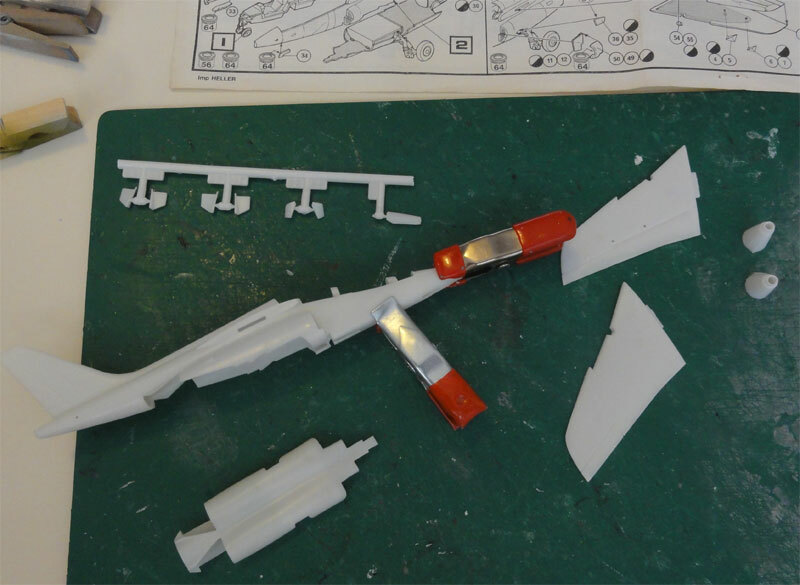 On the kits, I did not install yet the undercarriage legs at this stage. The nose wheel door is usually seen closed on parked Alpha jets. Note that the nose wheel gear is fitted offset as on a real aircraft. Main gear doors are usually also seen closed when parked and these are as moulded with the kit. Only smaller main gear door parts are to be set open. Inside the main gear bay I put a piece of plastic card in the center at the beam. 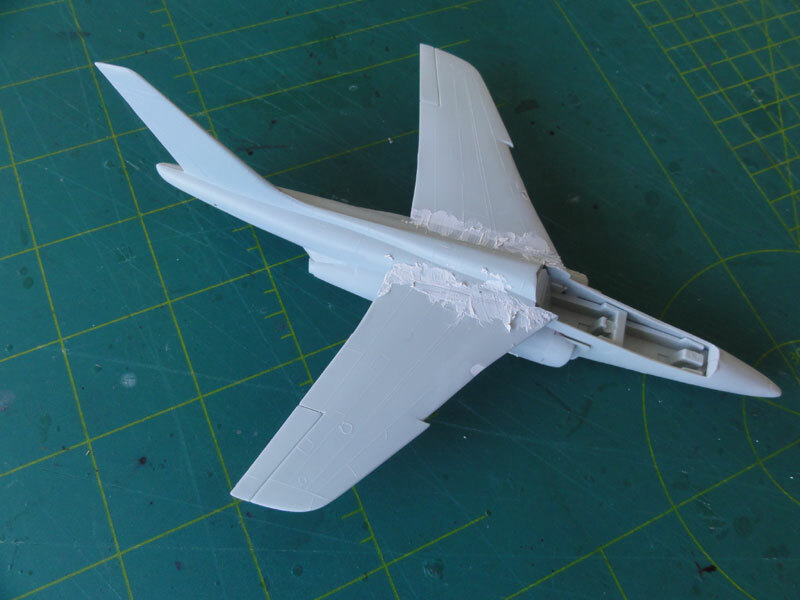 When closing the fuselage, there are awkward large horizontal seams and steps running in the lower fuselage that need sanding and some putty. 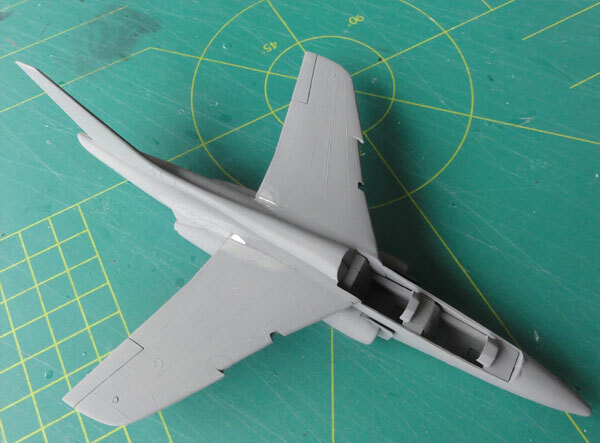 Also, there is a large step at the lower fuselage belly that needs filling and sanding. The 2 exhaust openings were made a bit bigger with an X-acto knife. In the wing leading edge 2 lights are seen but these were only used on the prototypes (on production Alpha jets the landing lights were set on the main gear legs). So close the leading edge gaps with putty and sand flush. 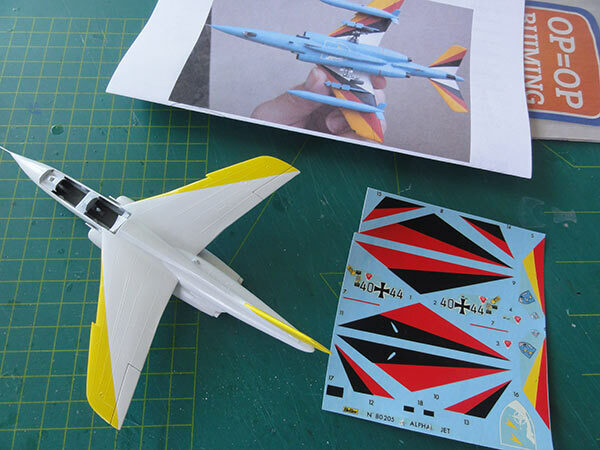 The vertical tail fin shape of the kit was sanded a bit pointier at the trailing edge. The cockpit tub gaps can be closed with white glue. The horizontal stabilizers are to be correctly set at an angle but seem a bit too large (about 0,5 mm) in chord. I used them as per kit though but their mounting pins are very vulnerable so installed these much later as a final step. 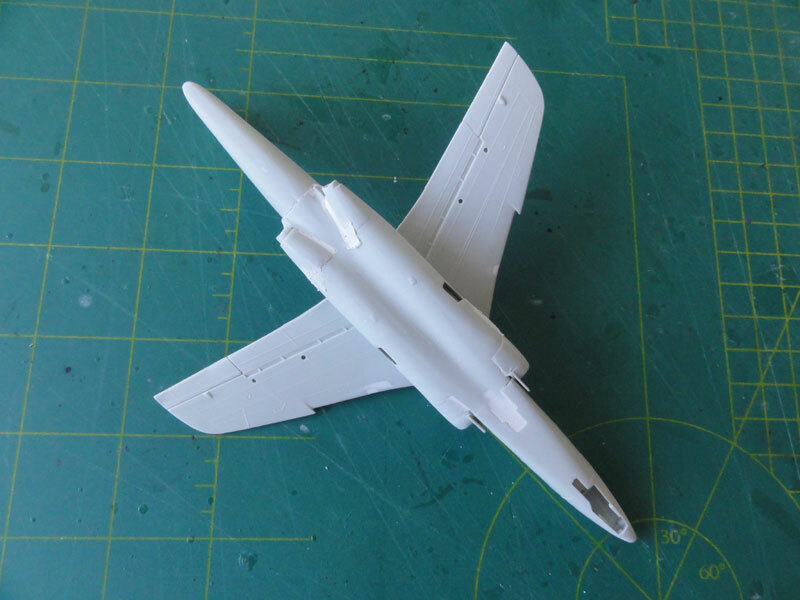 When the basic model parts and possibly any "add ons" were assembled, a light grey base coat was airbrushed. 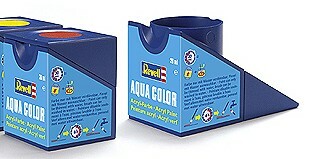 Often, I use Revell Aqua grey 75 "steingrau" acrylic for the base colour. Any imperfections are filled with putty and sanded as needed. I needed some rework on sink marks in the fuselage sides. 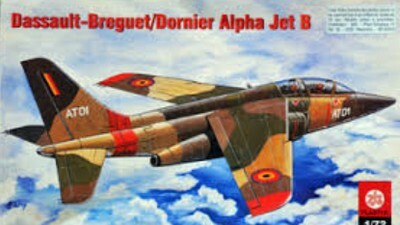 The model would than get the desired main paint scheme with the various colours. (this will be described for each model made). Detail parts are also painted with a paint brush, often still in their sprue. Landing gears were painted aluminium as well as gear door inner surfaces and aluminium wheel hubs. Tyres were painted with coal black. Final details are adding landing lights on the main gear legs. 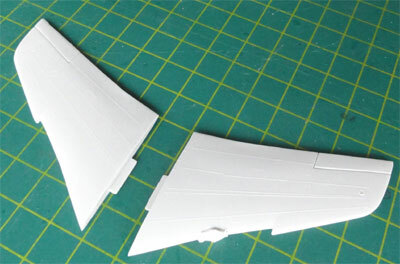 I also cut out small notches at the wing tips for the anti-collision lights. These notches were filled later on with Micro kristal kleer and painted transparent red and blue. When canopies are to be set open, this will need the razor saw to cut the single piece canopy in this Heller kit, a risky task. One can also decide to set the canopies closed. 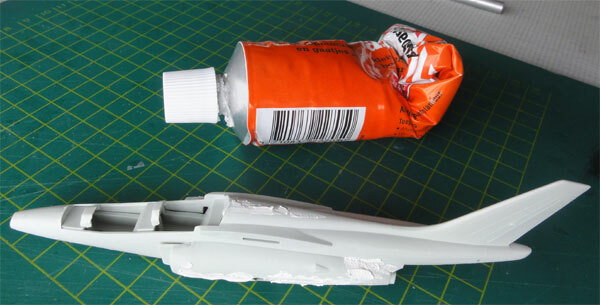 Some sanding is than needed to close the canopy gaps, use white glue as well. Do this before applying any paint for the paint scheme yet, first mask off the clear areas. Also add a transparent blast screen between the forward and aft tub from e.g plastic from a blister package. 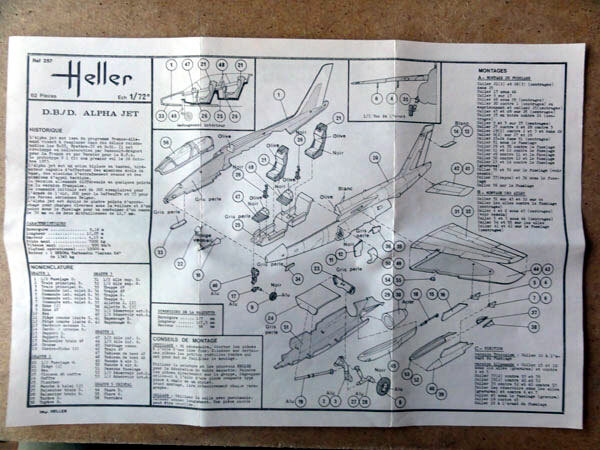 As noted, the first Heller kit was made straight out of the box with the colourfull West German Luftwaffe JABO G43 markings for the "colibiri" based at Oldenburg "Fliegerhorst" in North West Germany. The kit decals for the undersides unfortunately have some serious flaws, the colours are reversed! My modelling friend Eric, whom I know for over 30 years, pointed this out, so I was warned! So I decided to airbrush most of the colours and not use the large coloured decals. A lot of work but worthwhile for the "colibri". 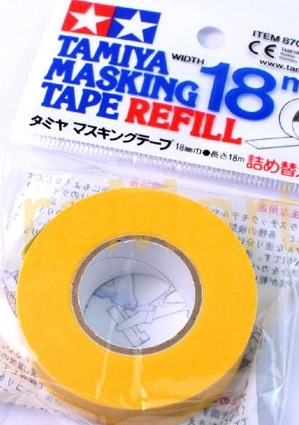 The various colours need careful masking with fine tape like from TAMIYA. Make sure to completely cover all areas between colour airbrushing! Otherwise overspray will spoil the model. The flap hinges are seen as well here. 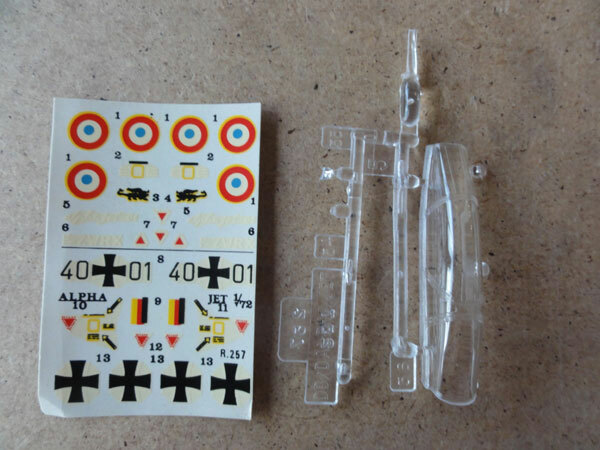 The smaller decals as per kit sheet were now set in place. Each intake and splitter plate leading edges were painted black. Details like landing gear were set in place. 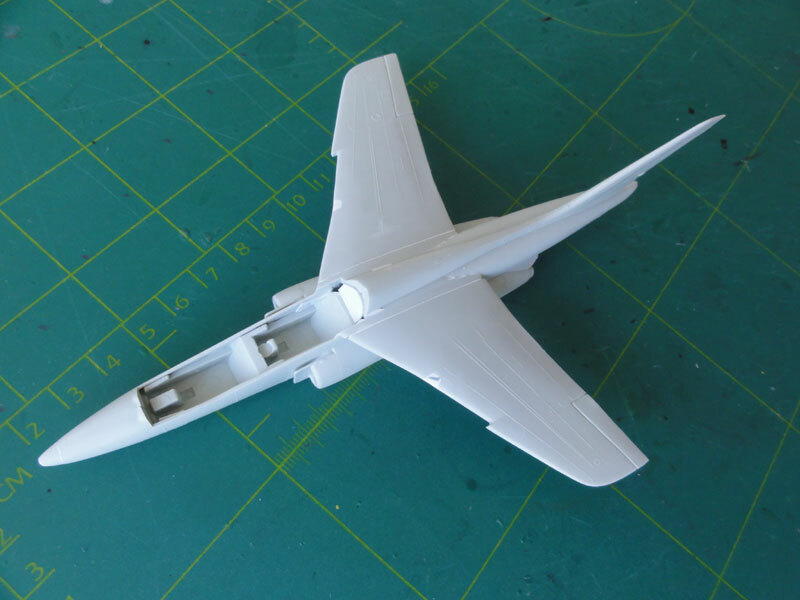 On the lower fuselage smaller fairings and antennas as well as the arrestor hook were fitted. These were also painted, in most cases light blue. The landing gear lights were fitted on the gear legs, the coloured bits came from a decoration shop. The wing tip lights (cut out notches) were filled with Micro Kristal Kleer and painted transparant (Tamiya clear) red and blue. The model now got a gloss varnish coat with the airbrush. 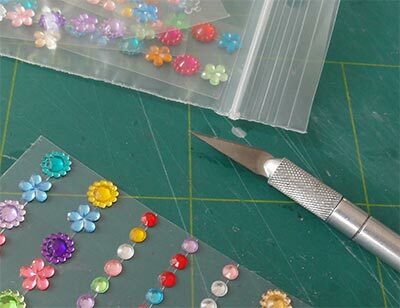 This will give a nice even sheen and protect the many decals. I used Johnson Future / Pledge that was thinned with IPA. The canopies show a ejection detonator chord in a "zig-zag" pattern. These were inscribed with a scriber on the clear areas. It was decided to set open only the front canopy on this model. This section was separated with a TIGER razor saw. Inside the canopy, 3 small mirrors were set in place made from thin metal foil. The inside canopy frames were painted dark grey though I was not sure about that colour. The outside frames were obviously painted gloss white as for the "colibri". The wind screen was fitted without any problem, and for the aft canopy sections any small gaps closed with white glue and painted when dried. The final touches were installing the opened up front detailed canopy. A raising actuator was set at the rear made from a thin metal needle piece. That completed this kit. The German Luftwaffe was forbidden and disbanded at the end of the Second World War mid 1945. 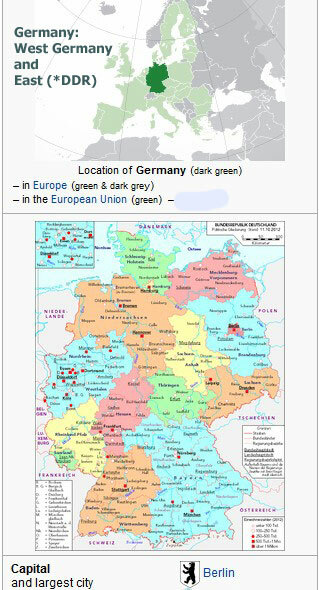 In 1955 West Germany joined NATO and a new West German Air Force was founded in 1956 during the Cold War. Still called the Luftwaffe it was part of the Bundeswehr and aligned with the Northern British command and Southern American command. Several American aircraft were made available such a the F-84 Thunderstreak and F-86 Sabres. In 1960, the first F-104 Starfighters arrived that served until 1991. An air arm was also set up to execute naval strike, called the "Marineflieger". Missiles were also deployed like the Nike Hercules, Hawk and Pershing. 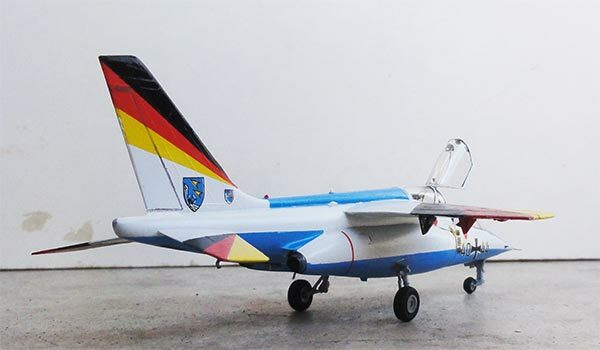 European cooperation started to produce aircraft with European defense programs. The result was a transport aircraft like the C-160 Transal, with first deliveries in 1968. Much jet training was moved and started up in the USA such as at Holloman and Luke AFB to improve pilot training. Also, many F-4F Phantoms were acquired in the mid 1970s and for training the European Dassault-Breguet / Dornier Alpha Jet. The first European Panavia Tornado's tactical bombers arrived in 1979. October 1990 saw the unification with East Germany DDR as the Iron Curtain had fallen with large political changes in Eastern Europe. 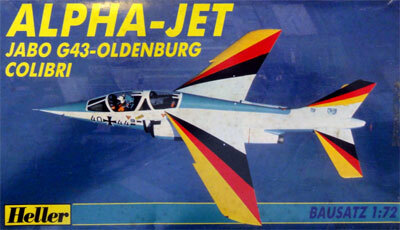 Some of the DDR NVA aircraft were even briefly used by the "new" Luftwaffe like several MiG-29. With the introduction of the latest advanced Eurofighter/ Typhoon air defense fighter, the MiGs were transferred to Poland who meanwhile also had joined NATO. The Luftwaffe also deployed several aircraft to international missions, like to former Yugoslavia, in mid 2000s patrols over the Baltic states and Afghanistan. Drastic cost cuts in the last decade has resulted in large force and aircraft numbers reductions with now some 8 operational air bases. New aircraft like Airbus A400 transports are purchased only in small numbers. 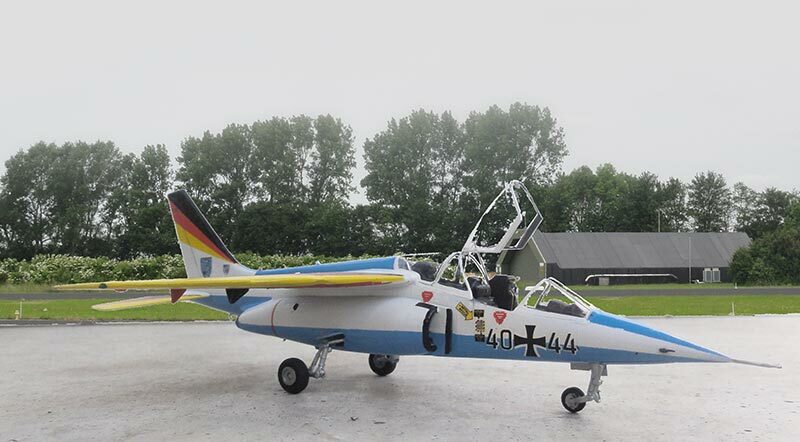 LUFTWAFFE JABO G43 Oldenburg "Colibri"
A nice Alpha jet in a colourful "colibri" scheme.